Just as we've introduced new wellness offerings, we are also keeping our line of supplements stocked with quality, safely-sourced products. As always, we encourage you to speak with your IPC provider before beginning a supplement regime. This month we are featuring two products aimed at natural pain relief. 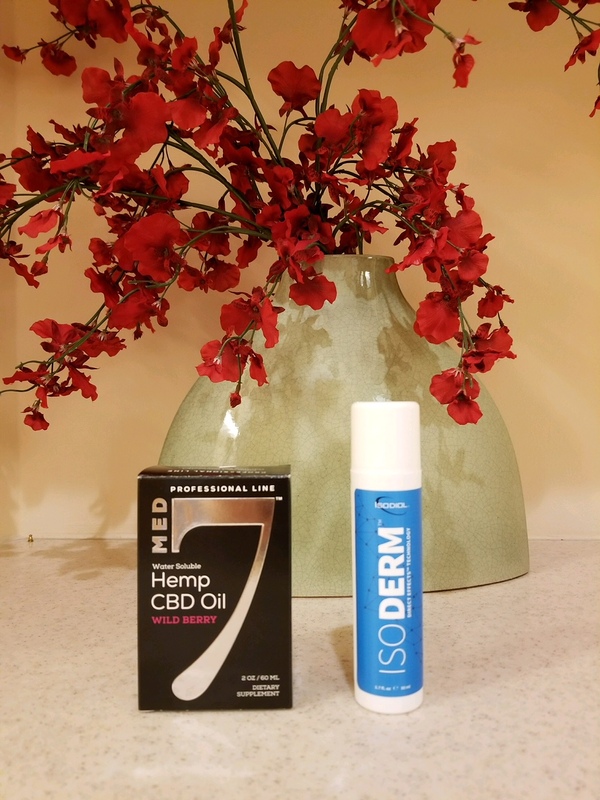 The active ingredient in both products is CBD which is an abbreviation for cannabidiol, a prominent naturally-occurring cannabinoid component found in cannabis sativa. And yes, cannabis sativa is the scientific name for marijuana. However, Med 7 CBD Oil and RapidCBD IsoDerm Cream are devoid of any psychoactive effect. Dr. Levitt recommends use of Med 7 or IsoDerm Cream for anxiety, insomnia, pain, tremors and to lower dependence on opioids. As an example, the IsoDerm Cream can be applied to the back of the neck twice a day or as needed for pain. CBD helps regulate the endocannabinoid system (ECS). There are two types of cannabinoid receptors found throughout the body (CB1 and CB2), but they are most abundant in the brain and immune system respectively. While clinical studies are ongoing, the ECS is being tested and evaluated for its role in pain management, anti-inflammatory effects, anti-anxiety, memory, appetite suppression, movement disorders including seizures, and ADHD to name a few. We encourage you to visit or call our office soon to place a hold on a product before it sells out. Contact our office at 480.776.0626 to place an order or for any questions. Thinking about dipping your toe into a plant-based diet? Consider testing your taste buds with a Vegan Lasagna recipe that includes a plethora of ingredients to satisfy even the pickiest eater...and they are all vegetarian. 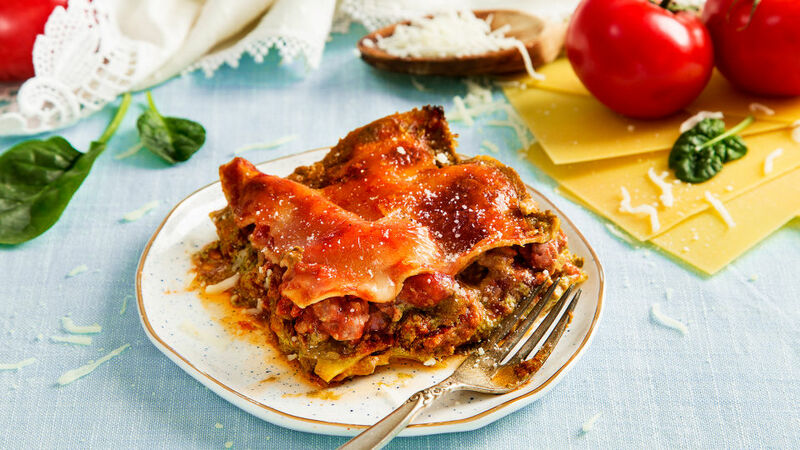 This recipe derives protein sources from eggless lasagna noodles and tofu. A serving of this comfort food has 219 calories, 6 grams of fiber and 13 grams of protein. We are wrapping up our four-month series on removing toxins from our lives with a recap of the top tips from each issue as well as suggestions for use of a few natural products by a local expert. Please visit our newsletter archive to see full articles from March-June. An easy way to stay chemical free when it comes to cosmetics and skin care: d ownload the " Think Dirty " app before your next purchase. This handy tool will help you determine if your product is "dirty" and it will make suggestions for "clean" beauty products. If you're a "do it yourself" (DIY) type, there are numerous natural alternatives that can be created at home to ensure safety and a cost savings. For instance, try mixing water, rubbing alcohol, essential oil and natural dish soap to make an all-purpose cleaner. More DIY at home cleaners can be found here . Add plants to your living environment. Even Dr. Levitt makes sure the Innovative Primary Care offices are filled with live plants. Lady Palms have been proven to improve the air quality in your home. Four other plant species are also great options to help you breathe easy and relax in green filled surroundings. Reduce your use of canned foods to get the BPA out of your diet. Most cans are lined with BPA-containing resin. Check for those that say they are BPA free. Moving toward foods that are fresh will transform your diet anyway and rid your body of toxins. Check out this list of BPA canned food. Thanks to fellow physician Dr. Paul Wolfson for his great tips and belief in living a cleaner lifestyle. His excellent list of natural products is a great reference for your use. We've only listed a few of his suggestions below, but you can visit his post to get a full listing of ideas. Glassware from Life Factory makes it possible to drink from glass at home with some extra padding to protect them from breaking. Sponges made from renewable products such as crushed walnut shells make cleaning up easier on the environment. Visit Natural Value to see the wide array of products offered. Similar to the DIY options above, Truce offers an all-natural cleaner made from five ingredients. Finding natural laundry detergent can be challenging. Thanks to Dr. Bronner you can check out his Sal Suds Liquid Cleaner that is safe on both dishes and clothing. When workouts or diet modifications are just not making a difference with stubborn fat in problem areas such as the abdomen and those areas we oddly call "love handles," Innovative Primary Care has a new offering that can help you achieve a slimmer appearance without surgery or downtime. SculpSure is a breakthrough in light-based body contouring designed to removing unwanted fat effectively and efficiently. The 25-minute procedure destroys fat cells that are then naturally absorbed and removed from the body. Patients typically begin to see results in as little as six weeks and optimal results are typically seen at 12 weeks. 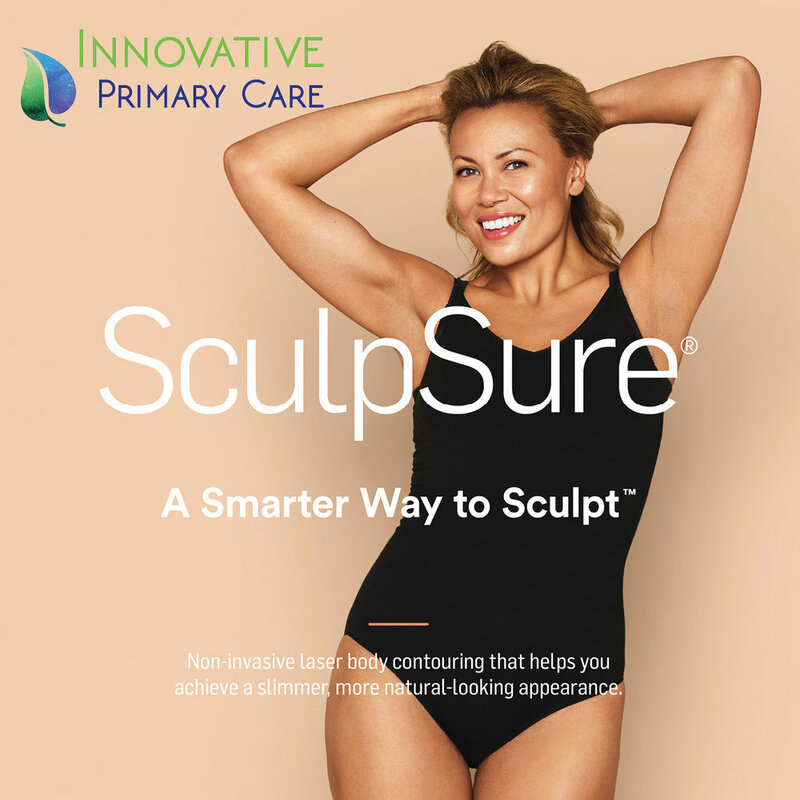 Call our office at 480.776.0626 to learn more about SculpSure or schedule a consultation with Dr. Levitt to determine if you are a candidate for body contouring designed to reduce stubborn fat in problem areas. SculpSure is a new option to support the way you look and feel. IPC providers and service options also offer additional support. An IPC provider may discover lack of sleep or a change in your hormones is affecting your progress. Services such as bio-identical hormone replacement therapy , a broad range of supplements and other modalities such as Psychotherapy & Hypnotherapy, Acupuncture and Jin Shin Jyutsu offered through our office partners can also help with reducing stress and building healthy habits. Spring Cleaning isn't just for closets! What about the junk that's collected in our bodies. Researchers at the U.S. Department of Health and Human Services National Toxicology Program know that we are exposed to more than 80,000 different chemicals on a daily basis, with only a small portion tested for safety. Dr. Levitt recently returned from another conference on toxins and how they impact our wellness. She is continually seeking to help her patients live a healthier, cleaner lifestyle. Because of that commitment, we'll explore various steps you can take to do that here and in subsequent newsletters. You may have heard of BPA or Bisphenol A. BPA is found in polycarbonate plastics and epoxy resins. Polycarbonate plastics are often used in containers that store food and beverages, such as water bottles. They may also be used in other consumer goods. Epoxy resins are used to coat the inside of metal products, such as food cans, bottle tops and water supply lines. Epoxy coatings line the more than 131 billion food and beverage cans produced in the U.S. annually. Some dental sealants and composites also may contain BPA. Arizonans have adopted some unique habits with plastic water bottles compounding these issues. Putting a plastic water bottle in the freezer and then using it throughout the day is dangerous. Changes in the chemicals of the plastic occur when it's frozen and then later thaws. Even worse is drinking from a plastic water bottle that's been in the Arizona heat for the day. Plastics break down through the act of cold and heat. If you have water that's been exposed in this way, pour it on a plant or grass to put it to good use. And tell your friends. Help them avoid these chemicals as well if you see them using these bad habits. Use BPA-free products. If not labeled, check the recycled codes for 3 or 7. Some, but not all, may be made with BPA. Avoid them. Cut back on cans. Reduce your use of canned foods since most cans are lined with BPA-containing resin. This might be tough, but moving toward foods that are fresh, not canned, will help. Check out this list of BPA canned food. Commit to using reuse shopping bags. The more you can contribute to keeping plastics out of the food chain, the better. The plastic bags, whether from your local pharmacy or grocery, usually enter back into the food chain through marine animals and birds. Additionally you'll help cut down on the use of petroleum. Avoid heat. The microwave and dishwasher can be your enemy. The National Institute of Environmental Health Sciences advises against microwaving polycarbonate plastics or putting them in the dishwasher because the plastic may break down over time and allow BPA to leach into foods. And don't drink water from a bottle left in your hot Arizona car. Stay hydrated to support one of the simplest and most effective ways to cleanse your body of toxins. Strive for a minimum of eight 8 oz. glasses a day. And now with the temperatures heating up, going beyond that would be helpful. We invite you to show off your healthy habits on our Facebook page. Anyone who posts a photo with your glass containers or glass water bottles will be entered into a drawing for a 20 oz. Contigo Purity Glass Water Bottle. Please post your photo by March 31. Next month we'll delve into simple actions you can take to keep more toxins out of your home. Cheers. We are honored and humbled that you have entrusted your healthcare to our staff and team of providers. As we enter into 2017, we know changes are coming for healthcare. Some we know of, some we don't in the ever-changing dynamic healthcare industry. Changes are taking place at Innovative Primary Care as well. Beginning December 29, I have shifted my patient work to the MDVIP personalized health care platform. This will allow me to bring a new and refreshing dimension to those who have selected to become MDVIP members. I realize that this model of care may not work for everyone. That saddens me and I will truly miss those who are unable to join us. My focus is on practicing prevention utilizing my training in functional medicine, and fostering deep and personalized care for my patients. I have decided to make the switch to this platform because the current medical model does not allow for this time of sustained, personalized and in-depth care. Through my years of working with and serving patients, I get the greatest fulfillment by developing long term and in-depth relationships with patients. Many have followed me over the years, even traveling long distances. Now with the MDVIP platform, it will allow for patient visits at the hospital, phone conversations, coordinating your care with any specialists and following your healthcare journey. MDVIP puts the patient and doctor relationship first. What that looks like is more personalized attention, longer appointment times if needed, same day and next day appointments and real time communication through texting and the MDVIP portal, which includes HIPPA secured email. Further screenings include assessment of emotional health, sleep efficiency and sexual health. The second phase of the exam takes place three weeks after the first part of the exam, and will include reviewing of all test results, performing a complete physical exam, and detailing an outline for achieving optimal health based on the test results. The emphasis is on detailed understanding of your health concerns and a close (and real time) relationship regarding your concerns. We can continue to enroll individuals in MDVIP even after the start date and are open to patients not currently with Innovative Primary Care. If you'd like to continue your care outside of the MDVIP program, please utilize our providers who would be honored to serve your healthcare needs. They include Dr. Chinwah, MD and physician assistants Jane Stevenson PA-C and Todd Schuster PA-C, for internal medicine care, along with Naturopath Dr. Xan Simonson. And the wellness services of Psychotherapy & Hypnotherapy through Dr. Ilana Oren and Jin Shin Jyutsu with Debbie Elman. If you are interested in receiving the benefits of bioidentical hormones, I'm continuing to provide this service as well. You can utilize your insurance for all hormone lab work, with the exception of pellet insertions, which continues as a fee for service. If you have any questions, please feel free to call us at 480.776.0626. On behalf of the full staff at Innovative Primary Care, we wish you healthy, safe and joyous holidays and look forward to seeing you in 2017. What is convenient, low calorie, may reduce your risk for disease and is full of vitamins, minerals and fiber? Fruits and vegetables. You really can't go wrong by upping your intake of nature's bounty and with the change of seasons approaching, we encourage you to check out the offerings at a local farmers market. Right now is a great time to find apricots, cherries, bell peppers, blueberries, butter lettuce, cantaloupe, honeydew, corn, eggplant, garlic, peaches, plums and radishes. When you visit the farmers markets, there are always many people willing to help you come up with great ideas for preparing these foods and creative ways to incorporate them into meals. Dr. Levitt loves snacking on organic apples with natural peanut butter and many on the IPC team follow her lead. After you've "picked" your fruits and veggies at a local market, you may needs some tips and recipes for preparing them. Visit Fruits & Veggies More Matters for meal and menu planning. We're off to try a Grilled Eggplant and Tomato Sandwich for lunch. Sometimes feeling better isn't as easy as just wishing it would happen. We are complex beings that rely on nutrients to maintain health in all areas of our bodies. There are many nutrients that can be derived from food and supplements that have been proven to aid in supporting our brain. Here are some top picks by IPC Naturopathic Physicians Xan Simonson and Cindy Romero. If you’re wanting to support your mood, you might want to look more deeply into eicosapentaenoic acid (EPA). New research has confirmed it’s positive effects on mood even more so than docosahexaenoic acid (DHA). EPA is a potent anti-inflammatory, which is what we want for our body and our brain, while DHA contributes to the fluidity of cell membranes. IPC offers three supplements featuring both EPA and DHA. They are Pro Omega 3, Omega Pure EC and Omega Pure Krill. Probiotics play a crucial role in keeping your digestive system in good shape - your brain is only as healthy as your gut. The nerve cells in our gut manufacture 80 to 90 percent of our body's serotonin, the neurotransmitter we need to stay sane. IPC offers Pro Biotic Plus with a formula that contains 17 different strains of probiotics. Vitamin B-12 has been proven to improve mental health. A study by the American Journal of Psychiatry found that 27 percent of severely depressed women over the age of 65 were deficient in B-12. IPC offers several supplements with Vitamin B12: liquid form or sublingual. Dr. Levitt is a fan of Dr. Perlmutter, who champions Turmeric’s impact on your brain because of its ability to activate genes to produce antioxidants. IPC offers Curcuplex CR as a great antioxidant and anti-inflammatory supplement, and because it also contains black pepper which increases the bio-availability (or absorption) of curcumin. Curcumin is capable of crossing the blood-brain barrier. That means it gets put to use more effectively for our brain health and anti-inflammation needs. Amino acids are the special building blocks of protein, some of which gets transformed in our bodies into neurotransmitters. Without adequate amino acids, your brain can't work and you get sluggish, foggy, unfocused, and depressed. L-Glutamine Powder might be a great option. Other recommended brain boosting supplements include Vitamin D, Vitamin C, Magnesium, Calcium and Melatonin. And we always recommend you speak with your provider before starting a supplement to ensure there are no contraindications and to insure your regime is established appropriately. Do you believe that the food you eat can improve your body and your mind? Dr. Levitt does and encourages her patients to focus on quality proteins, fruits and vegetables that are the best natural sources of the vitamins and minerals we need to stay healthy and fend off disease later in life. Multivitamin to help energy, immune support and generally address deficiencies that can happen in time with aging and poor diet. IPC carries both Nutrient 950 and Spectrum 2c. Omega-3 fatty acids for healthy cholesterol and brain health. Healthy levels of Zinc are needed for crucial functions in your body such as immune function to fight illness, healthy cell growth and development and to ensure proper sense of taste and smell.